Use the links to the left or the photos below to navigate your way quickly to the products we offer for fire water storage and fire and safety equipment. Whether you need affordable fire protection, or are looking for water storage tank suppliers, we can help with products to for rural, agricultural, industrial or commercial water storage, and firefighting applications. Check out our complete fire storage water tank selection on our fire suppression tanks product page! 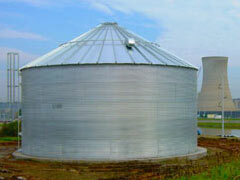 Click below to learn more about our bulk water storage options! Curious about the available accessories for fire suppression tanks? From fire hoses to replacement liners and pumps, we've got what you need. Click below to see our full accessory selection! Are you looking for industrial and commercial products or other supplies for your job site? GEI Works has you covered, visit our product page to learn more about our complete product listing, click below!